- Artificial Lifelike Fake Food Set Decorative Food Kitchen Decor Kids Pretend Play Toy. - Realistic bread for bakery cake sample display, display cabinets furniture, home decoration, kids pretend play toy. - It can also be a early childhood teaching props, gifts tricky toy, creative design, photography, film props. - Noted: This only a artificial food, not real food. - #1 - 3 Pieces, include 1 croissant bread (11cm / 4.3"), 1 long loaf bread (27cm / 10.6"), 1 round bread with sugar (7.5cm / 3"). 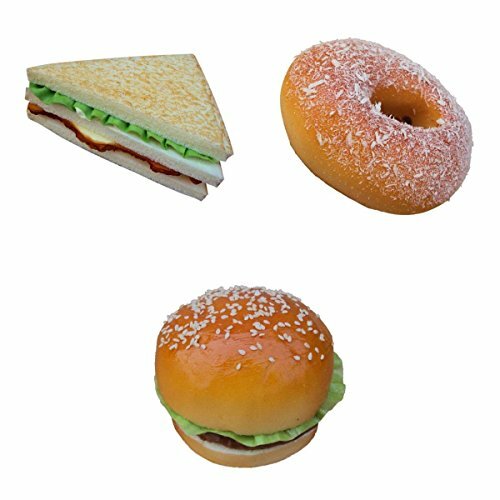 - #2 - 3 Pieces, include 1 sandwich (15x5cm / 5.9x2"), 1 hamburger (9.5x8cm / 3.7x3.1"), 1 donut bread (10x4cm / 3.9x1.6"). - #3 - 4 Pieces, include 1 cyprinoid carp (22cm / 8.7"), 1 tuna (31cm / 12"), 1 carp (34cm / 13.4"), 1 Thailand crucian (18cm / 7.1"). - #4 - 3 Pieces, include 1 cyprinoid carp (22cm / 8.7"), 1 spotted fish (30cm / 11.8"), 1 tuna (31cm / 12.2"). - #5 - 4 Pieces, include 1 cyprinoid carp (22cm / 8.7"), 1 lettuce (19cm / 7.5"), 1 green cabbage (18.5cm / 7.3"), 1 cabbage (10cm / 3.9"). - #6 - 4 Pieces, include 1 cyprinoid carp (22cm / 8.7"), 1 tuna (31cm / 12"), 1 spotted fish (30cm / 11.8"), 1 Thailand crucian (18cm / 7.1"). - #7 - 4 Pieces, include 1 tuna (31cm / 12.2"), 1 lettuce (19cm / 7.5"), 1 green cabbage (18.5cm / 7.3"), 1 celery (34cm / 13.4"). Artificial Lifelike Fake Food Set Decorative Food Kitchen Decor Kids Pretend Play Toy. Realistic bread for bakery cake sample display, display cabinets furniture, home decoration, kids pretend play toy. It can also be a early childhood teaching props, gifts tricky toy, creative design, photography, film props. Noted: This only a artificial food, not real food.